France Today, the world’s leading travel and lifestyle title about France, is aimed at readers who have a love for French travel, culture, gastronomy, shopping & entertainment, art & design, society & politics, real estate for sale and holiday rentals. First published in 1985, France Today magazine is one of the most established titles serving the international Francophile audience. In 2016 the magazine was increased to 164 pages and given a fresh and contemporary new design with a host of new features to bring even more of France’s wonderful destinations, culture and cuisine alive on the page. The new France Today is a true celebration of all the best that France has to offer with experienced writers and photographers who have a lifelong passion for their subject and love to share their knowledge. 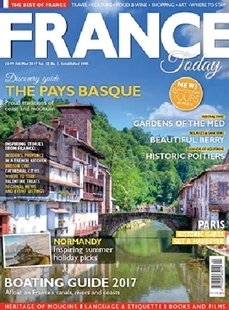 Topics covered include gastronomy, helping you to discover the country’s best restaurants, bars and bistros; arts and culture, giving readers the information on the variety of events that take place throughout the whole of France; and travel, with all the latest news, routes and traveller essentials, where to eat, travel advice, language and etiquette tips for travellers and lots more. High Point Holidays run walking holidays in the Queyras region of the French Alps. Well known for its sun dials, which alpine village in the Queyras is one of the highest villages in Europe? If you would like a copy of our 2017 brochure, please state 'Brochure Request' next to the answer.